I can almost feel it. Fall is right around the corner in the Pacific Northwest and that means one thing: It’s almost soup weather! OK, fall actually means many things (like cozy sweaters, lots of Golden Milk, and plenty of evening baths), but you get the point. This soup is amazing, friends! One sample bite in and I believe I started talking to myself about how delicious it was, which was really confusing for everyone in the room. In other words, this is talk-to-yourself-it’s-so-good soup. Plus, it’s simple! Just 1 pot and about 30 minutes required. The base for this soup is a mixture of late summer vegetables, vegetable broth, and fire-roasted tomatoes. Then comes beans and gluten-free pasta for a bit of fiber and plant-based protein. And finally, greens! I went with a handful of spinach, but kale would be lovely here, too. This would make the perfect soup to whip up when you need something healthy and satisfying on the table fast. I don’t use a slow cooker, but I think it would even work well as a “set it and forget it” type of dish. And while it’s delicious on its own, it would also pair well with my Vegan Parmesan Cheese, Vegan Gluten Free Biscuits, Fluffy Spelt Vegan Rolls and Creamy Kale Salad with Shallots and Chickpeas. If you’re into this kind of soup, be sure to check out my 1-Pot Lentil Chili, Lentil Dal, Creamy Tomato and Red Pepper Soup, Chipotle Black Tortilla Soup, and Curried Butternut Squash Soup. 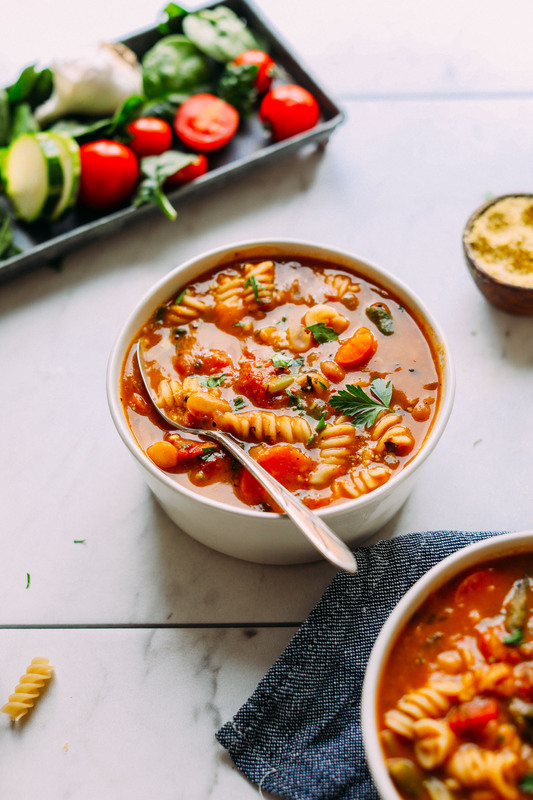 Easy, 1-pot vegan and gluten-free Minestrone! Simple, wholesome ingredients, 30 minutes to prepare. SO delicious and perfect for fall and winter! Heat a large pot or dutch oven over medium heat. Once hot, add water, onion, and garlic and stir. Cook for 3 minutes, stirring occasionally. Add zucchini, fire-roasted tomatoes, vegetable broth, basil, oregano, nutritional yeast, red pepper flake (optional), coconut sugar, and beans. Stir to coat. Reduce heat to low and simmer for 4-5 minutes, stirring occasionally. Taste soup and adjust seasonings as needed, adding coconut sugar to balance the flavors (optional). I added more dried basil, oregano, and salt. Add kale or spinach (or other green) and stir. Cook for another 3-4 minutes to wilt the kale and allow the flavors to meld together. Turn off heat and let rest for a few minutes before serving. To serve, divide soup between serving bowls and garnish with fresh herbs and vegan parmesan cheese (optional). Store leftovers in the refrigerator up to 3-4 days or the freezer up to 1 month. Be careful not to overheat the soup when warming leftovers, as the pasta is tender once cooked and will get mushy if overcooked. *To keep this recipe grain-free, use a grain-free pasta or omit and sub more beans or vegetables! *Recipe inspiration from Food Network. Delicious. Used regular noodles instead of gluten-free. Doubled the recipe – should last me at least until I finish my two exams this week! It was ok ,but A little bland . I would recommend doubling all seasonings and perhaps add in A tin of crushed tomatoes. It turned delicious, even my picky eater kiddos loved it. Ever recipe I tried from here turned out 5 stars. This was beyond delicious! I used 6 teaspoons Italian seasoning and instead of vegetable broth, I used Garbanzo Bean Paste diluted in 6 cups boiling water. Also, I upped the tomato taste with 2 tablespoons of Tomato Paste. Yum. Thanks for the recipe. I have prepped my veggies for this recipe but am confused. I don’t want an overcooked or undercooked veggie to ruin the soup – it looks so delicius! The instructions say to add the green beans in both step 2 & 3. Which is it? Thanks! Hi Judy, the green beans are added in step 2 and the white beans or chickpeas in step 3. I hope that clears up the confusion! The minestrone soup was pretty good but what really elevated it to “delicious” was the spelt rolls on the link included in the recipe. This is absolutely delicious! I halved the recipe but still ended up adding the full can of tomatoes, but my base was still pretty watery and pale. Next time I might try blending some of the tomatoes or adding some tomato paste – Any other tips for getting a good soup base? Regardless, it tasted incredible and will definitely be one of my go-to recipes from now on! Hi Emily, so glad you enjoyed the minestrone! We wonder whether the type of broth may have been a little bland? If you haven’t tried our DIY vegetable broth, we would highly recommend it for a good soup base. I just made this and forgot to skin the chickpeas – the skins are now floating around in the minestrone. Is it ruined? The texture will be a little different, but we think it will still taste good! Will definitely save this as a favorite! Thanks for sharing! Yum! This was so delicious! I added some celery in when I cooked the onion. Great recipe! I’ll make this again and again! I’ve already sent the link to two people for them to try! #1 This was amazing! So healthy and tasty! Also, the green beans were still crunchy. Are they supposed to be for that blanched kind of way? I cooked everything longer just to get them done. I guess I’ll used canned next time or just precook them? Your green beans shouldn’t be crunchy, so they probably needed longer.. As for cooking time, everyone is different in the kitchen but we appreciate your review! Used celery instead of green beans because I didn’t have any. Also just used a single carton of veggie broth (4 cups) and 2 cups water. Still turned out great! 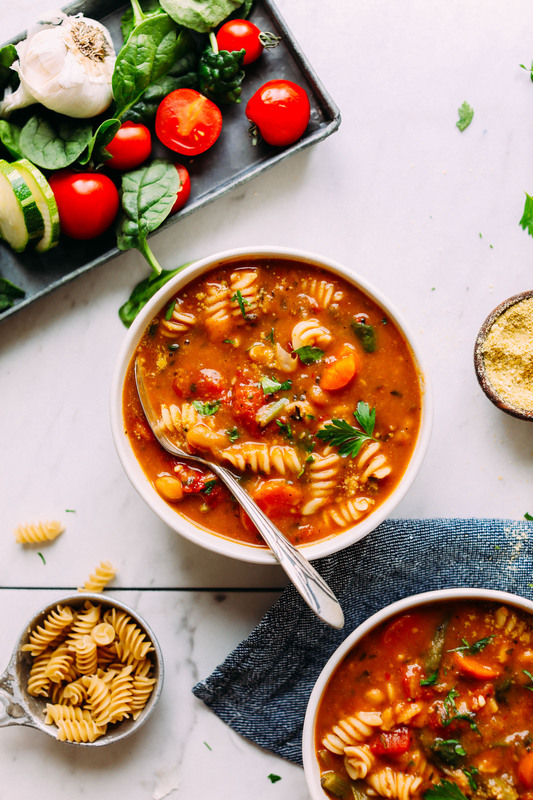 I have made many different Minestrone Soup recipes in my days, and this was my absolute favorite one hands down! – I used macaroni noodles instead of fusilli. I’m certain in looking back that 2 cups of macaroni noodles does not equal 2 cups of fusilli. They soaked up every single speck of the broth :( I just added water to reheat leftovers, which worked fine. Next time I’ll cook the noodles separately and add the cooked noodles to each soup bowl individually. Again, this was unbelievably flavorful and lovely to look at! Thanks for a timely recipe for use frozen out here in Indiana. Will definitely be making this over and over again this winter! Thanks for sharing your recipe changes, Beth! We’re glad you enjoyed it! I have made this recipe several times and it is always good. I’ve shared with many friends and they all love it! So tasty. I do add more of the tomatoes, just because the jar I had was 24 oz. Still turned out great. One friend made the soup a day before her dinner, and she cooked the pasta separately and added it when she heated it up the next day. That way the pasta doesn’t soak up all the broth overnight. I thought that was a good idea. Also, I use the ditalini pasta shape, and we like the kale not spinach. Great soup. We will make again and again! Made this for a potluck at work to give my vegan friend at least one option. She had the yeast I could borrow but I left out the sugar. (Didnt realize sugar could even possibly not be vegan). She absolutely loved it! It was easy to prepare as well! Thanks! Whoop! We are so glad she enjoyed it! Made this recipe last week and it was DELICIOUS! My partner and I both agree it is a fantastic recipe! Tastes so good you don’t even realize you are eating plenty of veggies and protein! I made the recipe as is, but next time I think I would add tomato paste at the very beginning when cooking the onions to give it more of a tomato taste. Either way great recipe and can’t wait to make it again! You had made a minestrone soup on the blog before if I’m not mistaken and I can’t seem to find that one! I’ve made this one too and it was delicious, but I was hoping to make the older recipe again. Is it still posted somewhere?? This soup is absolutely delicious! I’ll be making it all winter! Yum! This is now my “go-to” dinner because it is easy and really good. I had such high hopes for this soup. Unfortunately it tasted terrible (to me at least). I felt like the entire thing tasted like grass water with a bunch of noodles in it. We’re sorry to hear that this one didn’t do it for you, Samantha! Better luck on the next recipe! I first made this recipe last year when trying out a vegan diet for several months. Now that I’ve transitioned to a largely plant based diet, this amazing soup is a frequent meal and my family raves every time. I’ve got it memorized and I savor every bite. I love this soup. Yay! We are glad to hear that, Maggie! I made this recipe and it came out so tasty! Didn’t have zucchini so I threw in frozen veggies and it came out thick and delicious! Yum! Thanks for sharing your additions, Christina! I made this soup using Dana’s DIY Vegetable Broth (so excellent). I followed the recipe as written with no modifications. This is extremely flavorful and so satisfying. I love soup all year (and I live in Florida!). This recipe I will make over and over. I do find the pasta gets mushy; even as soon as the pot of soup is cooling. But I have found that to be true with any soups that contain pasta (GF or not). My solution in the past was to cook the pasta separately and add it to each bowl when ready to serve. I will do that on my future batches. I am so pleased with the outcome of this recipe. Thank you so much for sharing your love of food! This was wonderful! I added some extra water cause I found that the pasta took up a lot of it to cook but overall, it was so tasty. I would love to see your version of a potato leak soup next! Thanks for everything! 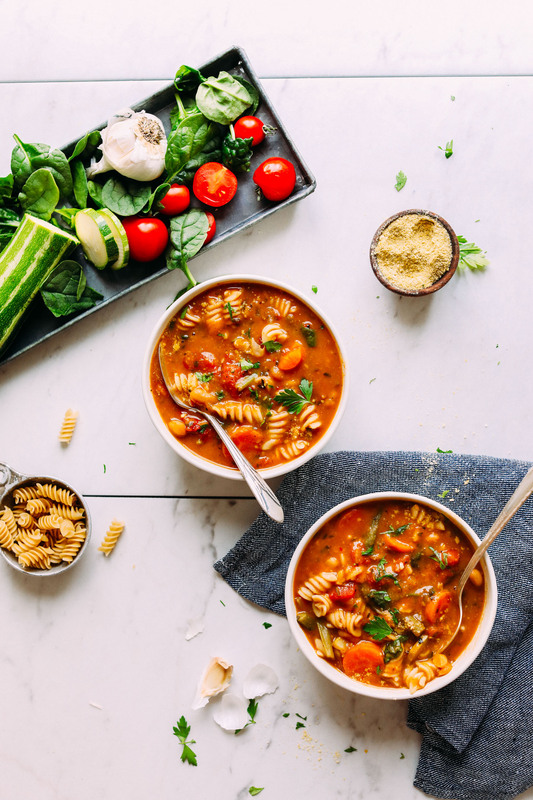 This minestrone is healthy, fun to make, and absolutely delicious! It’s officially my favorite food. I made this with Better than Bullion vegetable paste, chopped up some leftover baby carrots, and leftover red onion. Great clear out the fridge soup! Is there anything to substitute onion & garlic? I have made this soup several times and it is by far the best minestrone I have ever had. I pretty much follow the recipe as written but I add a 28 oz can of roasted tomatoes and a couple splashes of red wine if I have a bottle open. I have also tried it without the pasta and put little bits of cauliflower in instead and that was also tasty. Great recipe! I love this soup so much and I find myself constantly going back to it. I always add the zucchini and green beans during the very last minutes of cooking however, to prevent them from overcooking and going soggy. Instead of using canned tomatoes I also often times use any leftover jarred tomato sauce – it makes the soup more flavorful and gives it a bit more body. I like to use Ancient Harvest rotini for this soup as it works perfectly every time. I find that simmering it for about 10 min or until its a tad undercooked works best. As it sits in the pot the residual heat softens it a bit more. Thank You, Dana! So delicious and easy to make! Great! WOW. This was amazing. I added a spoonful of your almond ricotta to my serving too! Maybe thats weird – but to me, it was amazing! Thank you! I made this and it came out great! I have tried many of your recipes and they always taste delicious. 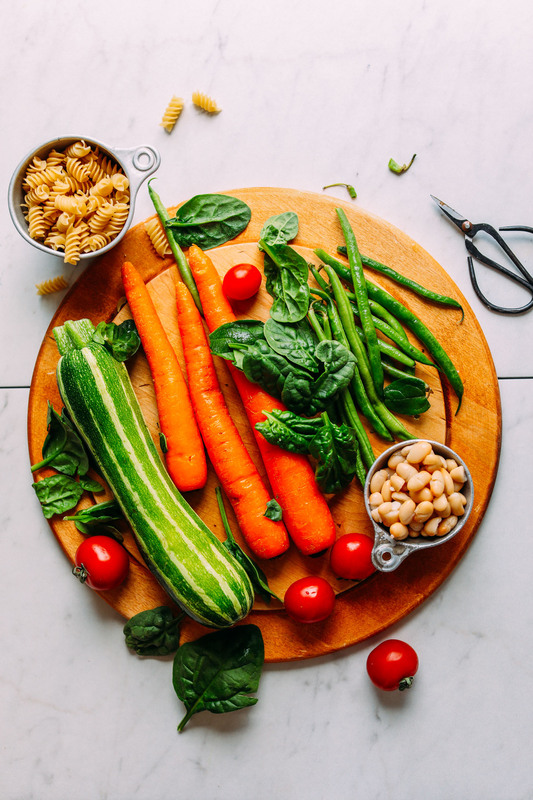 I really appreciate the care and effort u put into your recipes…I always recommend your website to others who are in need of healthy, tasty dishes! Thanks again for all your hard work. This is a great receipe….I cook the pasta separate and add it to the bowl of soup…works great reheating just add the pasta as you go more mushyness. I use no sodium cooking stock. I also either roast my own tomatoes, or.use a can of no sodium diced tomatoes. I have an issue with sodium too. I didn’t see where you add the beans. I added mine with the spinach. Also, I am the opposite of an expert, but I thought you always use half as much of the dried spices than fresh. Am i inorrect? Hi Donna! We add our green beans in step 2 and white beans/chickpeas in step 3! And as a general rule, you would typically need three times the amount of fresh herbs as dry. Thank u for replying to my post!! I love your recipes and in fact we had your sweet potato/ black bean burgers for dinner tonight. I dressed it with a little vegan mayo mixed with sriracha sauce, along with shredded raw red cabbage. I must admit that I’m still totally confused. Perhaps I’m looking at at the wrong version of the recipe, but there’s no mention of beans in my version of step 2. Maybe you talked about it in your opening, but I always go straight to the recipe instructions. Also, the recipe compares fresh herbs as compared to dried, not dried vs. Ground. Lastly, I forgot to mention the amount of pasta used in the soup. It said to add 2 cups, which I did, and I ended up with a potful of noodles. What am i doing wrong? If I’m going to work off the version that I have, I would use 3/4th cup of pasta and half of the dried spices. The little bit of soup, we ended up with did taste good. Thanks again for your help and your delish recipes. Comment, updated! Did you use 2 cups of uncooked pasta? In future, use 2 cups of cooked pasta! Yes, I did it wrong! I’m going to try it again tonight. Perhaps I’ll be able to make it correctly the second time atound. LOL! Thanks again. Never mind my query above, I see it must be an error in the Prep Time Box, the text below it shows prep time is 30 minutes, this is more accurate. Thanks! I just made this for my husband and we both LOVED it. It’s so rich and tomatoish. The fire-roasted tomatoes gives it such a nice spicy-smokey flavor, plus I added some Chipotle powder for a fun kick. This is seriously one of the best soups I have ever tasted! No excuses need to be made for any dietary restrictions when serving this soup; no one will miss either gluten or dairy, and meat would be easy to add or to serve on the side if desired. I am gluten intolerant and some of my in-laws are dairy intolerant, so I often find myself looking for vegan recipes, even though we all eat meat. I made this recipe to accommodate myself, my family and a vegetarian friend, and the soup was well-received by all. My only modifications were that I used white sugar instead of coconut sugar, and I did not have nutritional yeast. I used Great Northern Beans and spinach, and Ancient Harvest Garden Pagodas (corn/quinoa) for the pasta in one recipe and Manishewitz gluten free egg noodles in the other. The soup took me about an hour and 15 minutes to prepare a double recipe, mostly because I am slow at chopping vegetables and had to divide the double recipe between two pots. I was concerned about how the gluten free pasta would hold up in reheating, but the corn/quinoa pasta held up very well. The Manischewitz pasta swelled up and made that batch look very sloppy, but it still tasted great! This time, when I make it for my meat-eating family, I am going to add 1 lb. Italian sausage to a double recipe. Thank you for thus excellent addition to our meal rotation! We look forward to making this soup again and again! I made this recipe and liked the taste very much the first day, even though I felt there was a bit too much pasta for the amount of vegetables. The second day, I reheated it over super low heat, but even then, the gluten-free noodles fell apart and what’s worse they soaked up all the soup. I will for sure use either 1/2 or less pasta or even better substitute with 1/2 – 3/4 of the amount with potatoes. This soup is so delicious! Love the combinations of flavors. I didn’t use the nutritional yeast, and just added some more of the veggies that you called for. Just tasted it now and YUM. I can’t wait to eat this all week! I made this last night and it is delicious! I didn’t have any basil on hand so I threw in some frozen pesto we had from our summer harvest and it was perfect! I followed recipe exactly as directed otherwise directed and have been loving it! It tastes even better the next day! 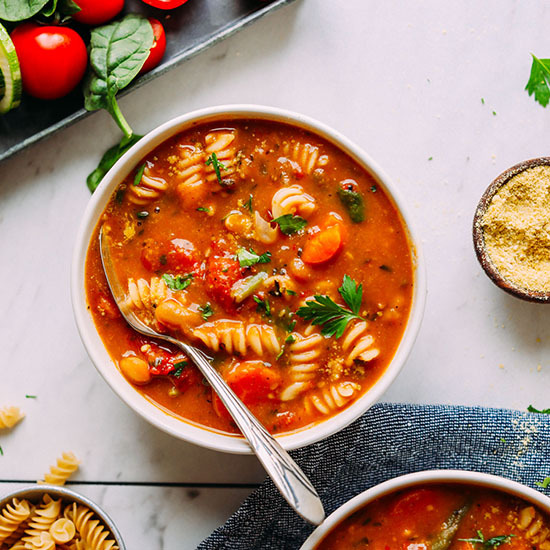 I have been looking for a good minestrone recipe and I’ve finally found it! I made this recipe and my family and I have made it a staple in our house! I am always trying to come up with vegan recipes that I know they will love to decrease their meat consumption. thank you for sharing! Delicious! Just made for me and my hubby. I am vegan he is not, he still loved it! He loves corn so we threw about a cup of frozen corn in. I added turmeric just to my bowl. So very good! I’m a new vegan so I am still experimenting and finding easy healthy and nutritious meals. Thank you for an awesome vegan recipe! I just made this recipe! I had a bowl that was topped with homemade (your recipe!) vegan parm. It tasted and looked fabulous! Perfect for a cold winter day! Sorry spell check messed up the spelling of your name- sorry Dana! Sorry, I said the vegan parm was your recipe but I got it from somewhere else as it was made with three ingredients: almonds, nutritional yeast and mrs. Dash salt free herbs. When I run out of my vegan parm I will try your recipe! The recipe looks great and I can’t wait to try it, but I’m a little concerned about the noodles. If I don’t finish all of the soup, will the pasta get mushy when I store it in the fridge? I’ve had issues with gluten free pasta falling apart before, but my bf has celiacs so we do have to use gluten free noodles. Do the Trader Joe’s noodles hold up pretty well? This was amazing! I can’t wait to make it again!! Dana, I have made and enjoyed so many of your recipes, but this one is especially phenomenal. It’s -2 where I live and this was warm, filling, and fun to make. Yummy! And kid-and-non-vegan-family-friendly! Bonus! Everyone loved it! Thanks again for your fabulous and simple recipes. I made this tonight and, oh my goodness, it was delicious. It was the perfect soup to eat on the first day of winter. It is so warm and flavorful. I forgot to buy fire roasted tomatoes, so I mixed some tomato paste with water and sun-dried tomatoes to equal the same weight and it turned out great! I will definitely be making this one again. Thanks Dana for another great recipe! Absolutely love this recipe. It’s super easy (a little time-consuming, but only because I’m a slow chopper), and ridiculously flavorful. I made this for my husband and our friends in a mountain cabin, and we ate it by the fire while it snowed. Since my husband and I are vegan and our families aren’t, we’re going to make another big batch to have for Christmas Eve and Christmas Day festivities. We LOVE this soup. It’s definitively soup season @ our house. Have been cooking my way steadily through your soup repertoire. 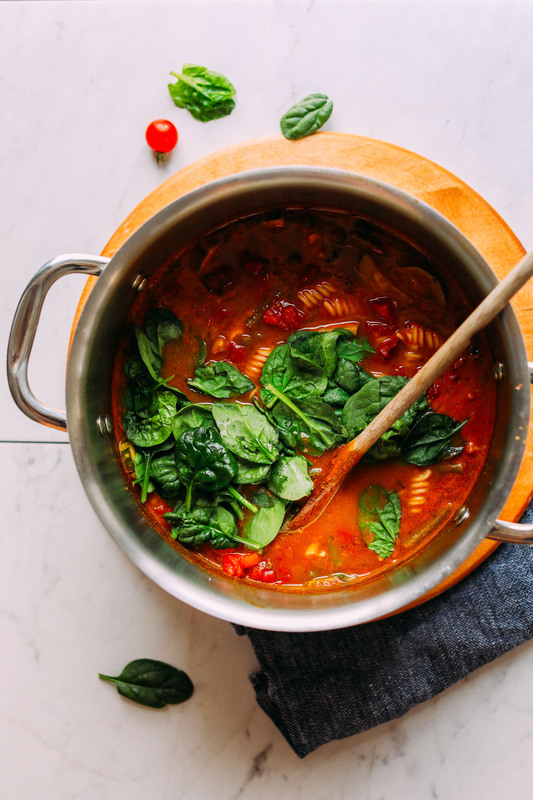 This minestrone is another winner. Left out the pepper flakes (DH is very sensitive to spice, can always adjust my own bowl to taste), had a poblano lurking in the fridge, as well as some green beans and a zucchini in need of a home, so they all went into the pot. I used orzo for the pasta, because I just happen to like smaller noodles in soup (if any). So, if you can excuse the liberties I took with your recipe, it is another solid winner that has become part of our regular rotation. Since we are only a two – person (and one feline) household, most soup recipes make enough to serve a hearty meal, leftover lunch for myself and another solid meal for the freezer. YUM – such a delicious, easy soup. I just used whatever we had in the house, yet the family was very impressed! My family LOVES this soup (including the three kids under ten.) I usually make it on the stove top but was wondering if I could make it in the Crock Pot? Would there be modifications of some sort? This was AMAZING!! My husband and my toddler loved it!! It paired so well with the vegan parmasean cheese! Perfect fall meal! Delicious!! The fire roasted tomatoes lend a rich, smoky flavour. Just made this for dinner tonight! I love the recipe, but for some reason the flavor just wasn’t there for me.. I used just canned diced tomatoes instead of roasted, so I put about three heaping tablespoons of tomato paste in the soup as well and it really helped to both thicken and make the soup richer! As always, your recipe was a hit in my house. Thanks!!!! Made this over the weekend. DH gave it a 10/5 This soup is going into the regular rotation for the season. I omitted to red pepper flakes, added a poblano (which gave a bit of background heat, nothing in your face), and used only 1/4 orzo for the entire recipe (DH watches his carbs), used garbanzos, because that is what is usually on hand in my pantry. Thanks for another wonderful recipe! I had pinned this recipe ages ago and finally made it, and it absolutely did not disappoint. My meat-loving husband loves minestrone, and after devouring bowl after bowl after bowl, he told me it was his new favorite soup. It is absolutely a cinch to make and takes no time at all. I will be making this soup throughout the winter. Thank you! Is the yeast an important ingredient? I love this soup! The calorie count seems low. Does it include the pasta? Hi Lindsey! Yes it does! So I’m no expert cooker but this soup turned out tasting awesome!!! It was a lot of work with all the veggies so maybe next time I’ll sub some frozen ones. From start to finish it took me about an hour and a half with all the prep. Again, I’m not someone who cooks often. Also, there’s a fine line where gluten free pasta is good and than turns to mush so beware of that, I don’t mind the broken up pasta though. I used barillas gluten free penne in this soup, everything else I bought at aldi besides the nutritional yeast. This was a great, very tasty, quick soup. I offered fresh finely chopped basil, red pepper flakes and shredded Parmesan cheese (for my not vegan family) for everyone to garnish their bowl of soup. It was an easy recipe to follow or adapt to your liking. Thank you! I will definitely add this to my recipe list. I made this last night. The process was very easy and I had most of the ingredients at home already so that was a plus. My family and I really enjoyed it. However, it ended up with that as much broth as I would like and the color was not there. I used half a cup less pasta and half a can of beans and still there was hardly any broth and it became more like a pasta dish. I will for sure make it again but use a few more cups of broth and less pasta or maybe add cooked pasta when ready to serve soup. Made this for my husband who isn’t a big veggie eater and he absolutely loved it. I waited until after he ate it to tell him all the ingredients (; So filling and delicious. Can I just say this recipe is fantastic! I’m so obsessed. My husband and I have literally had it every single week since you’ve posted the recipe! ? I just love how the gluten free pasta sort of melt into the soup and make it super creamy! Oops my first comment didn’t add my review. Here it is! So tasty!!! My bf and I loved it! I used great northern beans instead of chickpeas. Also didn’t have any coconut sugar on hand, so I used brown sugar. The only issue I had was some of the liquid seems to have either evaporated or was absorbed by the noodles. I think I might have simmered it a little too long, however I just added some more veggie broth and it helped. However the flavors are awesome! Topped with your vegan Parmesan cheese, which by the way I am OBSESSED with (I use slivered almonds instead of cashews) AMAZING! I subbed the green beans for asparagus and used chickpeas and kale. Tasty, but definitely doesn’t have the rich colors shown in the photo. I love that it has veggies, carbs, and protein all in one bowl- makes life easier! I loved this soup! I added broccoli too since I had some in the fridge. And a little each of onion and garlic salt for depth. Thanks for this hearty and yummy recipe! How much soup does this recipe make? Im catering for a large group soon and want to know how much to increase the recipe. I listed in the recipe it serves about 6! This soup was delicious and so simple!!! Thanks Dana!! Ive never cooked vegan recipes before and cannot find nutrional yeast. I’m hoping the recipe will be okay without…..? Hi Tori! You can leave it out! Made this soup when boyfriend and I were sick. Comforting, healthy and delicious- just what we needed! It is now known as the “magic soup” because it completely nursed us back to health. Will be a staple dinner this winter! Perfect! Served with crusty bread! This was the perfect meal for a chilly fall day! So delicious! This was a good, fast, simple soup. Perfect way to lead us into what is a seemingly never-starting Midwest fall. (Also, we are watching what we eat and this puppy is pretty guilt-free.) We had purple and yellow carrots on hand which were really nice in here. Skipped the nutritional yeast, but don’t think it suffered from it. Definitely got even better each day. Add this to the long list of recipes I’ve tried from this site and totally loved. Thanks, Dana! I made this in my Instant Pot and it is so good! I used Red Lentil Pasta, it broke up quite a bit so might try a firmer noodle next time. I made this soup earlier this week, I followed the recipe with only one change as I didn’t have coconut sugar. Flavor was great and tasted even better the next day however, all my broth disappeared! It turned into vegetable pasta by the end of the night. Other than that, great recipe! The same thing happened to me. Any idea what happened or how to fix that? Loved this so much! Genius as always, Dana! The only thing I’ll do differently next time is skip the chickpeas, I usually love them but they just didn’t mesh with all the fresh flavors in this soup. That’s just my preference though. Thanks for the amazing recipe! Yum! My husband doesn’t like minestrone, but he liked this! We didn’t use nutritional yeast but added a parm rind during cooking and squeezed lemon on top to serve. I might cut the sugar back a tiny bit next time, but I wouldn’t drop it. For the stock, 4 C stock and 2 C water worked. Thanks, Dana! All your recipes have been a hit at our house. We’ll make this one again! This soup is fantastic!!! I’m serious. My husband, who is NOT vegan or vegetarian, loved this soup and kept eating it! I froze a bunch of it in single serve portions and he kept taking them out of the freezer for himself! You have to try it. So much flavor. I used the pasta noodles that are made from veggies. You must use the fire roasted tomatoes. It was amazing. WOW, this looks fabulous! I love the idea of adding pasta–I’ve never seen that before! Have you ever tried Banza bean pasta? The fusilli reminds me of their rotini, which is delicious! Definitely have to try that pasta in this recipe! Greatings from Germany! We had this minestrone a couple of days ago and just loved it. It was easy to make and so delicious, we will sure have it again through winter season. I have no Ida if we can buy fire-roasted tomatoes in Germany, I never heard of it, so I just used normal tomatoes an some sun-dried tomatoes (cut in slices to add) some flavor. This was soo good- my sister was hella impressed as well. I made a few changes and I think it worked out great for me still! I couldn’t figure out if I was supposed to cook this with the lid on or off though. I felt like too much of he soup base evaporated. I love love love your recipies! So delicious, easy and a crowd favorite. Really tasty! I was nervous it wouldn’t have that umami from the parmesan rind but the pooch really worked well here. My zucchini ended up going bad in my fridge so I subbed some sliced mushrooms instead and like it so much I may never go back to the original. I might have gotten the wrong pasta as my calorie calculator has a much higher count than 127 per serving. The pasta alone (about 190 cals/57g) accounted for 130 calories per serving without the calories from the beans and veggies. I ended up about with approx 260/serving which is still awesome for such a substantial meal. Is it the organic brown rice and quinoa fusilli pasta at Trader Joes or did you use another lower calorie one? My hubbie who usually hates minestrone liked this one. We’re still getting hot weather here in Southern Ca so I waited for a “sort of” cooler day and whipped this recipe out quickly (along with your beer chili-a staple around my house) Bring on the Fall! SO yummy…!!! Very delicious and so nutritious. Thanks for another winner! Oh this is sooooo good! Love your recipes……love your book! I made this last night but it came out more as a stew than a soup ’cause I wasn’t that strict with the measures. I omitted spinach (there was none it the grocery store) and pasta because I decided it will be quite hearty without it. It was a really delicious and warming meal. Perfect for early autumn. Thanks! I made this tonight and it REALLY hit the spot! I added sweet potato, I only used 4 cups of broth, and I omitted green beans, noodles, and zucchini (because I don’t have it). I love it. Thank you so much! Just made this. SOOO delicious! I plan on making it again soon to bring to my coworkers. I’m now waiting for your spelt rolls to rise so I can pop them in the oven. Wonderful recipe!! Made this last night and both my husband and I LOVED it. So satisfying and perfect on a cold night. This soup was amazing! I just recently went vegan and have been making your chickpea red coconut curry non-stop and this soup is definitely going to be another repeat as well. Will leaving out the nutritional yeast make a big difference? If yes, is there something else I can use instead? You can just leave it out! I find it adds that “umami” flavor, but definitely not vital. Absolutely delicious! I made this for my boyfriend and I last night and we practically finished half the pot! Definitely would reccomend. So quick and easy. As always, your recipes are consistently yummy and amazing. Made this last night and it was a hit. No changes made except I used mini bow tie noodles since that was all I had at home. Thank you for all the recipes!! OMG!! This minestrone was so amazing. I am currently vegetarian and am in charge of picking meals for me and my parents (and cooking some of them). My parents aren’t veggie but they will eat what’s for dinner so I always choose vegan recipes and this one was a total hit!! Thank thank thank you for creating so many amazing recipes so me and my family can be more compassionate eaters. (p.s. I just got your 7 day plant book and making 3 recipes out of those. also we make your fajita recipe at least once a week.) YUM. I made this soup and it was delicious! Full of flavor and perfect for a chilly fall day. My meat eating boyfriend devoured multiple bowls. I love your recipes and photos. You inspire me to cook vegan all the time! Do i need to add the yeast? Nope! It’s optional if you’d rather not. This was really good! Adding a bit of vegan parm (Go Veggie) at the end gave it that extra touch of flavor. I particularly didn’t like the chickpeas, If I were to make it again I would leave those out. It was warm and a perfect meal for fall. I made this recipe immediately after seeing it posted! Doubled the spinach and added a little cornstarch, but otherwise followed the recipe closely…it was perfect! Thanks Dana for another delicious recipe! :-) PS I’ve so been enjoying following your adventures on Instagram! Easy and yummy. Was better the day after I made it. It had time to thicken up and for the flavorsblend nicely. I used canned tomatoes from my garden instead. Made a variation of this last night in my slow cooker with a few tweaks – ommitted chickpeas, for veggies I used carrots, peas, and broccoli, added some turmeric, and used cilantro instead of oregano as that is what I had on hand. Also added a splash of lemon juice and plain almond milk. I cooked everything less the pasta in the slow cooker on high about 3 hrs, veggies were a bit soft, 2 hrs is probably enough. And then added the pasta, not sure exactly how long it took to cook, maybe 20-30 minutes? I’d keep an eye on it if you plan to use the slow cooker, I let mine cook too long I think as while it wasn’t mush, it definitely soaked up pretty much all the liquid and I ended up with more of a “slop” than a soup. Still tastes great though and made a huge batch that will keep me going for the week, perfect fall food. Thank you for yet another fabulous and flexible recipe! I just made this! It’s delicious ;) the addition of the fire roasted tomatoes is sooooo good! I used San marzano crushed fire roasted brand. I’m not necessarily gluten free so I used tolerant brand red lentil rotini for extra protein! Awesome. Will make again soon. Love San marzano! Good choice. Thanks for sharing! This isn’t unique to this recipe, but I’m just wondering why you peel your carrots? I prefer not to, but I want to be sure I’m not missing some important food safety key! Thanks! I typically don’t, actually. But most people prefer that in case they didn’t purchase organic. But do whatever feels best for you! Ah! Splendid. Thank you for taking the time to reply. Hmmm followed it to a T but it didn’t taste that great — feels like something is missing but I’m not sure what…vinegar perhaps? Some kind of bite? I don’t know. What did I do wrong? Also, did anyone experience the pasta making the sauce too starchy and thick? I think in the future I will cook the pasta separately like someone else said and just top it with the soup. That might be a good thing to try. I preferred keeping it 1 pot and easy, but cooking the pasta separate may help. Otherwise, perhaps try adding more of the spices / seasonings? Delicious! I loved the freshness of this soup! I added a bay leaf while it was simmering and doubled the herbs. I will be making this all Fall and Winter! I made the Spelt rolls as a side and they were a perfect paring. Thank you for sharing your recipes!! Made this soup last night as my boyfriend has a cold and we both loved it. Ended up cooking some chickpea pasta separately and adding it to our individual bowls — my mom always taught me to cook the pasta separate for minestrone to avoid it falling apart and absorbing too much liquid when sorting leftovers. Lentils would be a lovely addition as well as any veggies you have on hand and need to make use of. Will absolutely be making this quick and lovely recipe again soon! Almost forgot, though not vegan I did add some collagen powder for a boost of protein. Great soup! I had a little time in the morning so I did everything except the pasta and kale before work then heated it up, added those last two ingredients when I got home. Made for a yummy dinner and made me wish we had more of your biscuits that I made on Sunday. Is the calorie estimate including the pasta? I made this tonight and it turned out delicious! I did the chickpea version and so so good! Yes, I had to add flavor adjustments but turned out amazing. Already passing the recipe on! Wonderful! thanks for sharing, Madison! Just amazing, so flavourfull. I just added some smoked paprika and pepper. Made this last night, and it’s lovely. My husband actually elected to add a little lemon juice at the end because we do love a little bit of acidity, and it turned out nice. I’ve got this in the fridge for lunch, and I have a feeling it’s going to be even better today. Thanks for the recipe! Yay! Thanks for sharing, Kim! Made this last night! So delicious. I didn’t add the coconut sugar, accidentally added too much fire roasted tomatoes (oops, read the ingredients wrong), left out salt, took the dried red chile pepper option, and added a bay leaf. I added 1 cup of uncooked TJ black bean fusilli and the noodle bloated a little bit but it was still so good ( I cooked it too long)! I still need to master the noodle soup technique LOL. All in all so good and so many VEGGIES – YAAASSS. As Dana says, let the soup rest, bc the flavors get a chance to blend together and trust me this soup just gets better and better! Thanks Dana another wonderful and simple recipe! So lovely! Thanks for sharing, Grace! I made this last night and it is amazing! My new favorite. I will definitely be making this soup again. I didn’t measure any of the ingredients, added lentil past, celery and some marina sauce that was in the fridge just to use it up. Really, it feels like no matter what I write, I can’t do this soup justice. Phenomenal, super tasty and the most satisfying soup I’ve had in ages. Thank you for this recipe, Dana! I cannot find fire roasted tomatoes at our local grocery. Can regular canned tomatoes be used? Sure! Diced, not fire-roasted tomatoes will work, too. I just prefer their smoky, rich flavor. If I don’t use gluten free pasta should I precook it before I add it to the soup? Is there any way to reduce the sodium content? This should be pretty obvious, but you can leave out the salt and use low sodium stock. Those are the only two ingredients here that contain sodium. I’m guessing the nutritional info is only a guide, as the sodium content will vary depending on the stock you use. Same! The sodium is what definitely concerned me when I first looked at the recipe. It’s spring in New Zealand but a little chilly today and I have a child home, sick, so I’m making this for dinner now. Already my kids are saying, “This smells so good.” Its easy and quick to make. Thanks for another great recipe, Dana! Delicious! I used Rapunzel vegetable bouillon with herbs for the vegetable broth, kidney beans, since that’s what I had around, and kale for the greens. I am not vegan and save the parmesan rinds so threw a couple of those in there (removed when done)….the soup is one of the best I’ve had in a while! Thank you, Dana! Your recipes never disappoint. This could not have come at a more perfect time! I have fresh tomatoes, onions, kale and green beans that need to be used up! Thank you! i would saute the onions and garlic in a bit of olive oil, to release their deeper flavor…then add the water and the other veggies in suggested order….but this is a nice recipe. The point of sauteeing in water is to keep oil/fat low. I’m sure you could use oil if you wanted, but a lot of people try to limit intake of oil, and water-sauteeing is an actual thing. YUM! Incredibly delicious :D…I didn’t have roasted tomatoes so just use one large fresh tomato and added a little bit of pasta sauce to thicken the soup. Is the pasta precooked or is it meant to cook once added to the soup? I put in the pasta uncooked and it slowly cooked while the soup was simmering at various stages. They’ve answered below! Uncooked ?? be very careful with the pasta as mines overcooked. I would literally let it cook for 5 mins, as when you reheat and as it stands it cooks even more. Recipe above is definately not calling for pre-cooked. Lovely! Hope you enjoy it. I would recommend using a high quality pasta like DeCecco as it uses harder flour and holds up better. Most pasta over cooks after 10 minutes so I often cook it separately for 8 minutes and add to soup separately warming for 2-3 minutes. If you make extra don’t store with pasta as it will certainly overcook. Hard times in the first world. I’m a beginner, so this might be an obvious thing to many, but what is the reason for the coconut sugar (and so much of it… a full tablespoon)? I understand at a high level it’s to balance the flavors, but I don’t see any flavors that are extra pungent or tart that might need that much sweetening, so I’m just curious. Thanks for any info you can provide. I’m planning to make this as soon as possible, with some red lentil pasta. I’ll leave out the sugar (just because I rarely add sugar to anything Italian-savory), but I’ll leave a follow-up comment if the omission ends up a terrible mistake LOL :-) Thanks! Sometimes sugar is used in Italian dishes to balance out the acidity. That’s what my husband said. And that a pinch will do. Good luck! Good question! I find that tomato-based dishes especially benefit from a bit of sweetness to bring out their flavor. And in this case, balance out the saltiness. Good luck! Hey Dana, I know you mention coconut or other sweetener but wondering the specifics around coconut sugar as your choice – something you like about that one specifically? Would I be able to cook this in an instant pot(pressure cooker) If so any time recommendations appreciated. Thanks! I have done minestrone in IP before. Manual high pressure 5 minutes, natural release for 5 minutes and then QR. What does QR mean? Do you cook the pasta separately and add it to the Instant Pot after it’s done cooking? No. Add everything at once. QR means quick release after 5 minutes. Correct. QR Stands for quick release. Apologies. That color comes from the fire-roasted tomatoes! The richness came from the time it’s reducing down, the longer its cooked the thicker and darker the sauce is.